The American housing stock continues to age, especially as residential construction continues its modest rebound after the Great Recession. According to the latest 2013 American Housing Survey (AHS), published by the Department of Housing and Urban Development, the median age of owner-occupied homes is 37 years old, compared to only 27 years old in 1993. This aging trend signals a growing market for remodelers, as older structures normally require additional remodeling and renovations. It also implies additional demand for more new construction over the long run. 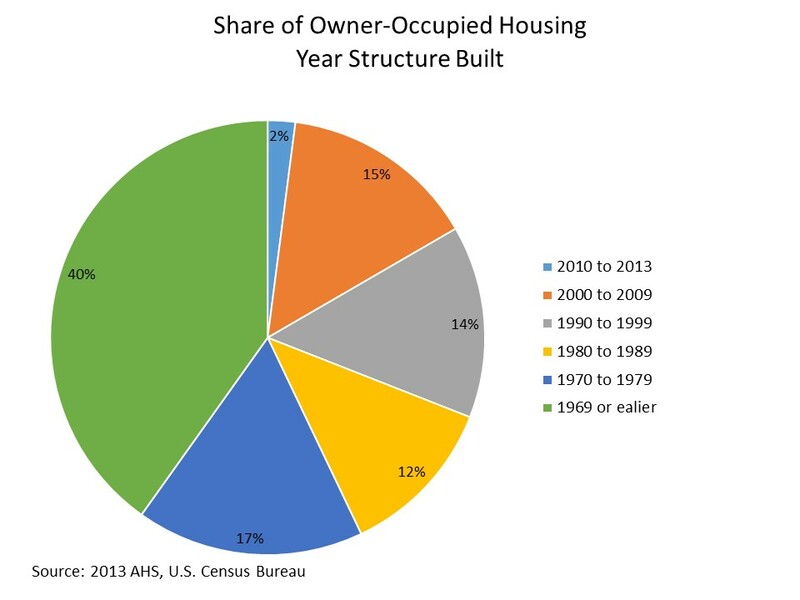 Approximately 2/3 of owner-occupied homes in the U.S. were built before 1980, with 40% built before 1970. Homes constructed after 2000 account for just 17% of the owner-occupied homes. And newly built owner-occupied homes constructed after 2010 only make up 2% of the housing stock according to the 2013 AHS. 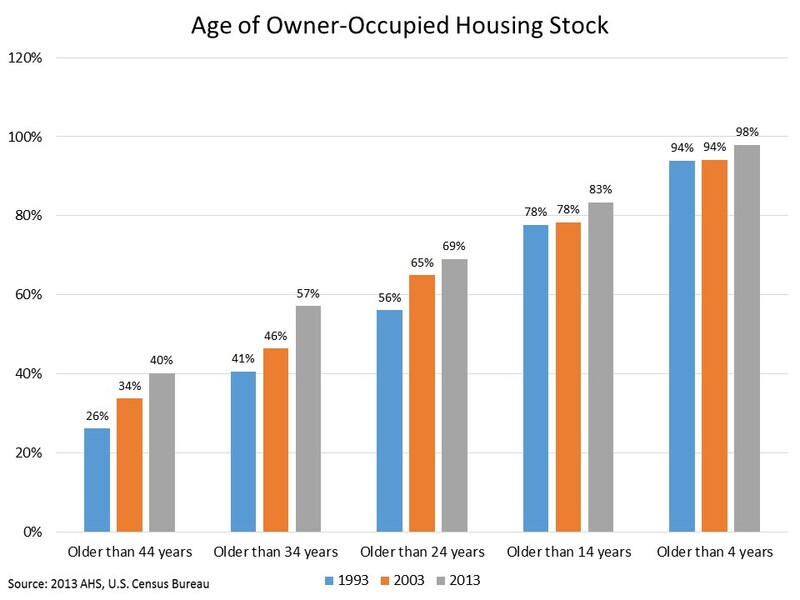 The impact of the aging housing stock can be seen in the age distribution of owner-occupied homes. 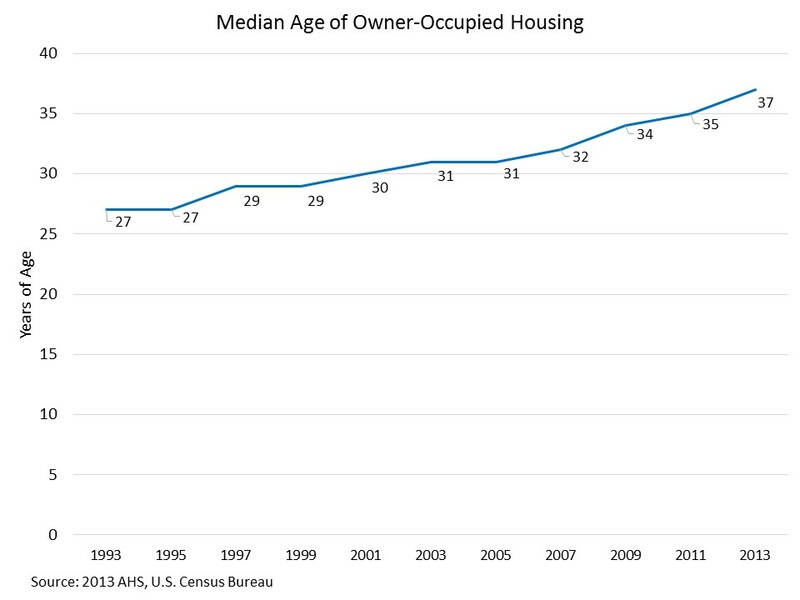 The share of housing stock that is over 34 years old in 2013 has increased significantly. It was 57% in 2013, but only 41% in 1993 and 46% in 2003. In contrast, the share of new construction in 2013 (i.e. owner-occupied houses less than four years old is 2%) is notably smaller than in 1993 and in 2003, when 6% of homes were built within four years. Clearly, the smaller share of new construction, together with an aging housing stock, represents an opportunity for builders and developers, as housing demand is steadily increasing over time. The age of housing varies with average household income and household size. 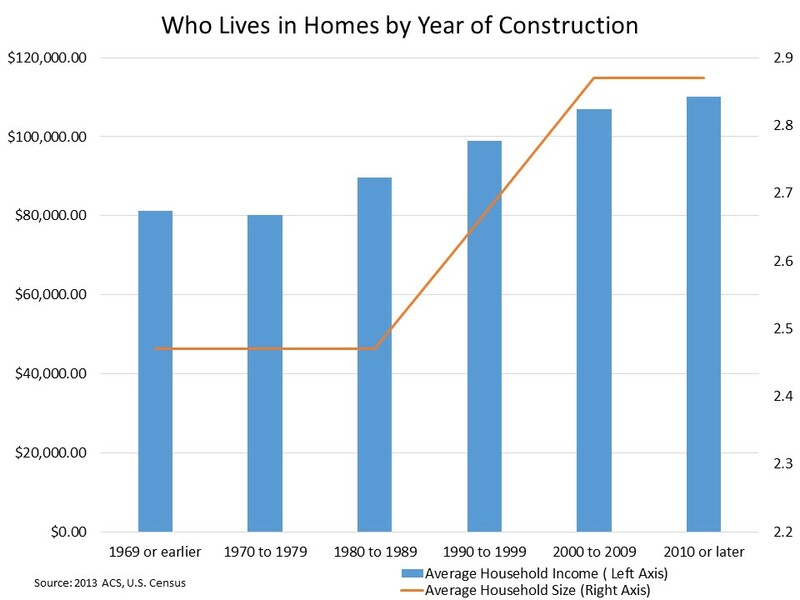 According to the data from the 2013 American Community Survey (ACS), households with higher family income and larger household size tend to live in the residential units built in recent years. In 2013, the average household income for homes built after 2010 was $110,099, higher than $81,213 average for those living in homes built before 1969. Household size decreases with the age of housing. Homes built after 2010 have on average 2.87 people living in them, compared to 2.47 people for homes built before 1969. This is consistent with the fact that new home buyers have more purchasing power and larger families. 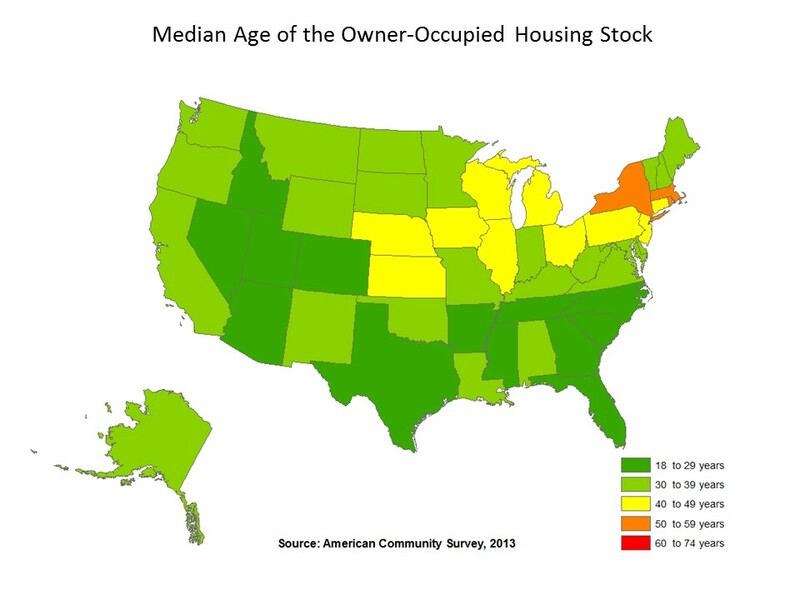 The age of housing stock is not evenly distributed across the United States. Based on the 2013 ACS, the geographic distribution of median housing age is regionally clustered. On average, New York had the oldest homes with a median of 55 years old, followed by Massachusetts at 52 years old. The median age of housing stock in the District of Columbia is 74. But it is not a perfect comparison with other states, since it is comprised of urban areas. The youngest homes are mostly located in the West. The median age of homes in Nevada is only 18, followed by Arizona at 23. The geographic distribution of the age of owner-occupied housing stock is strongly correlated with the population changes from 2000 to 2013. These population changes, including both natural growth and intrastate movement, reflect the evolution of demand for housing. 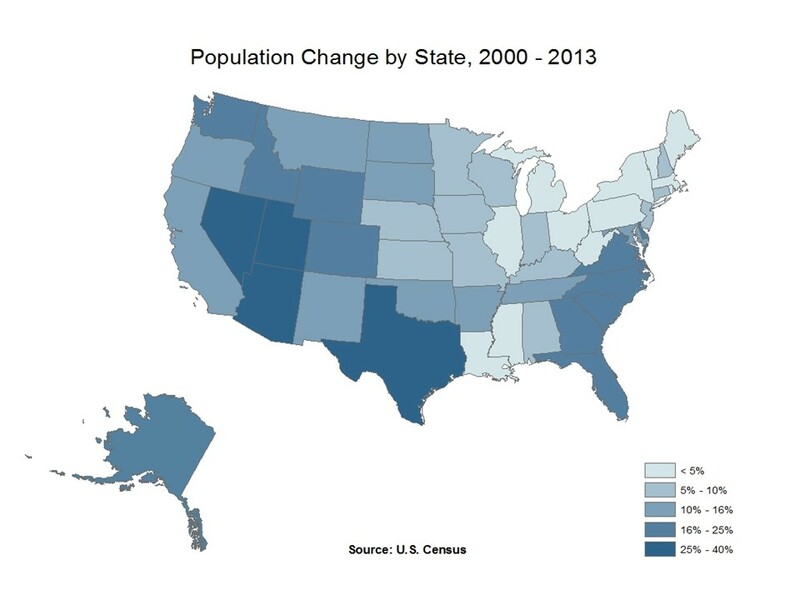 Nevada, the state with the largest change in population, also has the youngest housing stock. The age of housing stock is an important indicator for housing market going forward. Aging homes require remodeling and renovations, as these structures are, for example, less energy-efficient than new construction.